These cookies are the size of your palm, with thick, chewy edges, soft centers, and big chocolate chunks. It's surprising just how delicious this whole-wheat version of an old classic is. Unlike many of the recipes in this book, this cookie is made with 100 percent whole-wheat flour, which gives it a distinctive, nutty taste. Use a good bittersweet chocolate for these cookies, as the flavor of high-quality chocolate pairs best with whole-wheat flour. Add the butter and the sugars to the bowl of a stand mixer fitted with the paddle attachment. With the mixer on low speed, mix just until the butter and sugars are blended, about 2 minutes. Use a spatula to scrape down the sides of the bowl. Add the eggs one at a time, mixing until each is combined. Mix in the vanilla. Add the flour mixture to the bowl and blend on low speed until the flour is barely combined, about 30 seconds. Scrape down the sides and bottom of the bowl. Bake the cookies for 16 to 20 minutes, rotating the sheets halfway through, until the cookies are evenly dark brown. Transfer the cookies, still on the parchment, to the counter to cool, and repeat with the remaining dough. These cookies are best eaten warm from the oven or later that same day. They'll keep in an airtight container for up to 3 days. This dough is made to go straight from the bowl into the oven. 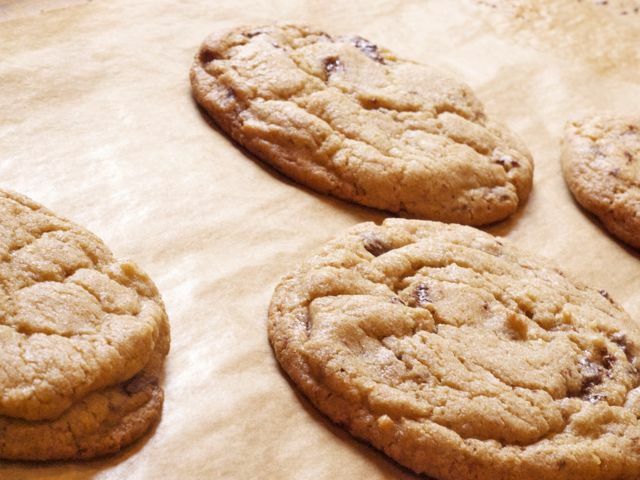 However, for freshly baked cookies anytime, you can refrigerate some of the dough for later. Be sure to scoop out the balls of dough before chilling, as the cold dough is too difficult to scoop. Also remember that cookies baked from chilled dough will be thicker than those made from room-temperature dough. This dough — scooped, chilled, and wrapped in plastic — will last in the refrigerator for one week, assuming it doesn't get eaten first!